This iPhone Application has Saved me Hundreds of Dollars! This is arguably the one ‘money saving’ activity that takes the least amount of time and effort. Literally one second! that is the time it takes me to check the ‘FGPnow!’ app on my iPhone to see where gas prices are heading for the next day. If you are constantly wondering or asking questions like “where are gas prices heading tomorrow?” , “How do I know if I should fill up today or wait till tomorrow” then, well, there is an app for that! 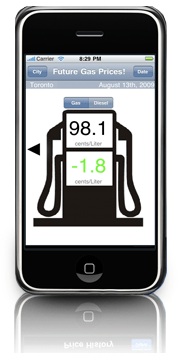 FGPNow -which stands for ‘Future Gas Prices Now- is available for the iPhone, as well as a new versions for the Blackberry. The application’s usefulness is in the ability to access it from your mobile phone, thus having virtual access to gas prices at all times. This way, you can make the most informed decision you can have as to whether you should fill up or wait. The forecasting is very accurate and reliable, so you can base your gas purchasing decision on this very app. I have been using it for over a year now and I can confidently say it has saved me hundreds of dollars. It may save you a dollar or two per fill-up or so, but remember, every bit helps and adds up. If the application is predicting gas prices to go up, I may choose to fill up that same day before it goes up. And vise versa when the prediction is for the rate to go down. The application doesn’t just tell you the direction, it also tells you the exact amount the price is changing by. So if you really need to buy gas, and the application is predicting the price to go down by a mere 0.2 of a cent, then it is not really worth waiting. While the original version covered only three Canadian cities, the newer version has many more cities, including: Calgary, Kamloops, Kitchener, Montreal, Ottawa, Regina, Toronto, Vancouver, Waterloo and Winnipeg. The application also gives price forecasting for diesel as well, but only for select cities. One feature I would like to see added is the ability to set ‘alerts’ of prices changes. For example, you can create an alert to be notified, through your phone or an email, as soon as the price for tomorrow becomes available. This should save you even more time.